The fact that the majority of marine aquarium fishes entering U.S. markets originate in the Philippines has long worried some aquarium trade stakeholders and critics. The concerns stem largely from the fact that illegal, unreported, and unregulated (IUU) fishing has been so prevalent in this nation of 7,107 islands and the government has appeared so unwilling to address it. The former president publicly stated that the aquarium trade was problematic because of its association with destructive fishing practices such as cyanide fishing. Asis Perez, the current undersecretary for fisheries and director of the Bureau of Fisheries and Aquatic Resources (BFAR), says today that, while there have been improvements, “for me to say that cyanide is no longer a problem is probably not true.” In addition to cyanide fishing, there is concern that certain species and certain reef regions are being overfished and that human rights are being violated. The good news is that there may be changes on the horizon—changes that could turn worries and anecdotes about the Philippines aquarium fishery into data essential to modern, data-based fisheries management. Only with good numbers of fish populations and fish exports can stakeholders know the true size and scope of the fishery, show sustainability where it exists, and enact reform where it is needed. “The goal,” says Perez, “really is to make sure, before the end of the president’s term, that all the necessary infrastructure…is in place so that only sustainable and legal fishing, including aquarium fishing, happens in our country.” According to seasoned observers, such reforms in the world’s most important source country could have a positive effect on the global aquarium trade and help insure a sustainable future. 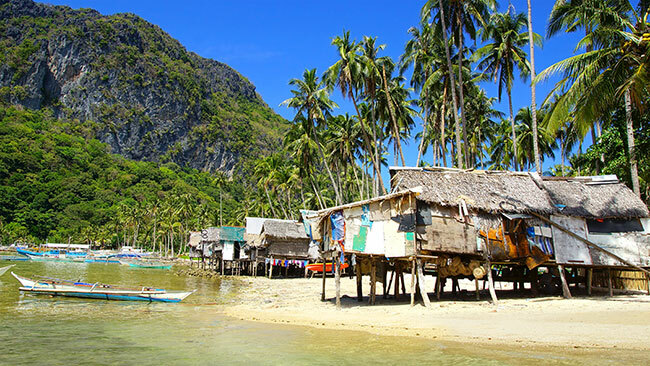 Fishing villages throughout the Philippines rely on income from the aquarium trade and are viewed as one part of a reformed, sustainable fishery. Image: Igor Plotnikow/Shutterstock. According to the Marine Aquarium Biodiversity and Trade Flow database (www.AquariumTradeData.org), which tracks U.S. marine aquarium trade imports, the Philippines is the number one exporter of saltwater aquarium fishes to the United States. The data show that more than 5.5 million fishes and other animals were imported for the aquarium trade in 2011, the most recent year for which data is available. 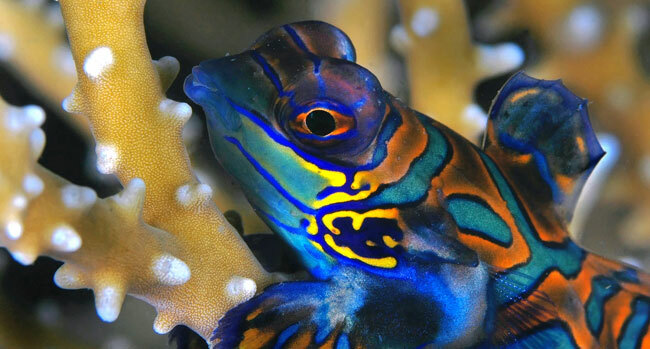 The vast majority of Philippine aquarium animals are exported to arrive in Los Angeles; Miami, New York, San Francisco, and Atlanta also represent major import centers. The Marine Aquarium Biodiversity and Trade Flow database is an online database produced by the New England Aquarium and Roger Williams University, with funding from the National Oceanic and Atmospheric Administration (NOAA) and the National Fish and Wildlife Foundation. Based on invoice documents obtained from the U.S. Fish and Wildlife Service, it represents the best available trade data. 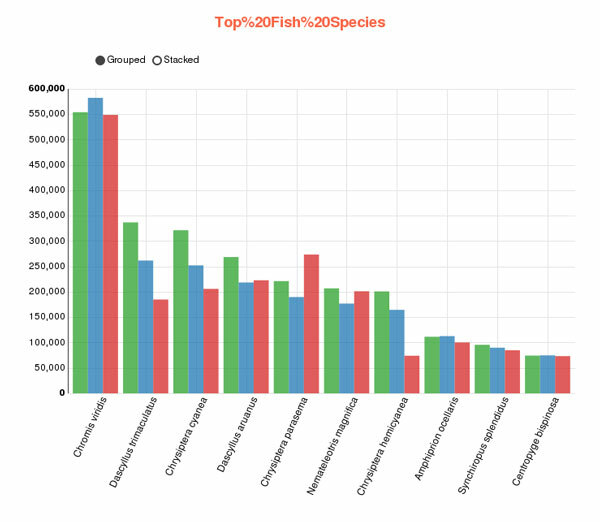 In addition to providing the first independent data on the U.S. marine aquarium trade’s volume, the database also helps to identify the diversity of species traded. 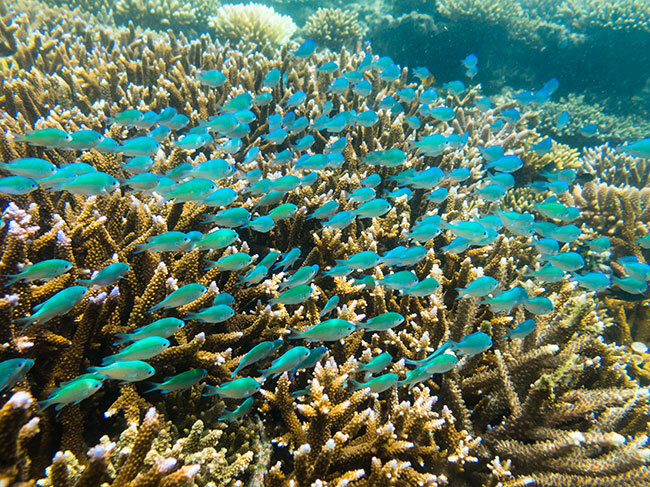 For example, it shows that the top imported species from the Philippines in terms of volume is Chromis viridis (the Blue-Green Chromis), with around 550,000 fish imported annually. The next most heavily imported species are Dascyllus trimaculatus (the Threespot Damselfish), D. aruanus (the Humbug Damsel), Chrysiptera cyanea (the Blue Devil Damsel), C. parasema (the Yellowtail Blue Damselfish), and Nemateleotris magnifica (the Fire Dartfish), which are all imported in volumes ranging from 175,000 to 336,000 individual animals annually. Chrysiptera hemicyanea (the Azure Damsel), Amphiprion ocellaris (the Ocellaris Clownfish), Synchiropus splendidus (the Green Mandarinfish), and Centropyge bispinosa (the Coral Beauty Pygmy Angelfish) represent the remaining top ten most imported aquarium fishes from the Philippines. 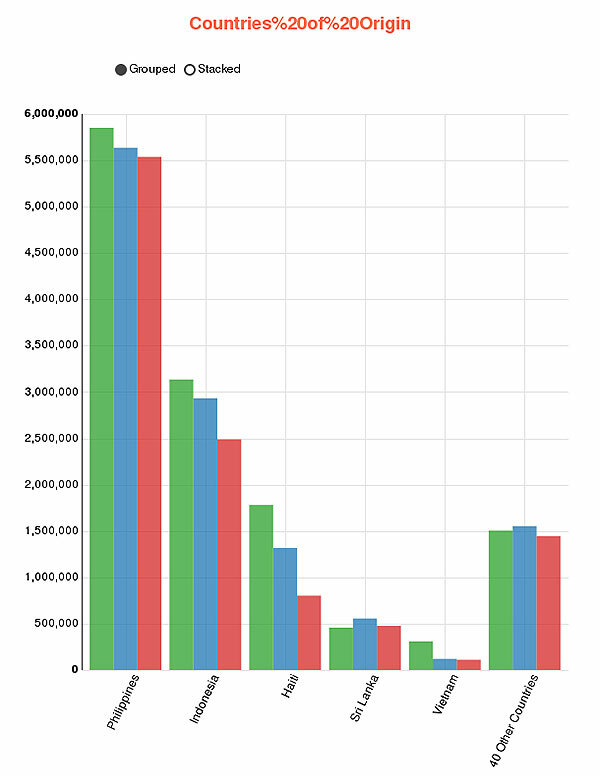 Comparing data from the Marine Aquarium Biodiversity and Trade Flow database with other data, it is possible to extrapolate some very general information about the aquarium trade globally. For example, the U.S. marine aquarium trade is considered to represent 50 to 70 percent of global trade, so a rough estimate of international exports is possible. Nonetheless, in order to move toward a more sustainable, responsible, and transparent trade, better data—and especially source country landings (animals harvested) and export data—are needed. For centuries, those looking beyond the innate beauty of the Philippines’ sandy shorelines, azure seas, and stunning reefs have understood and exploited its resources. Named Filipinas in honor of Spain’s King Philip in 1521, the world’s second largest archipelagic state was “discovered” in 1521 by Ferdinand Magellan, a Portuguese explorer in the employ of Spain, with an eye toward trade and resource extraction. Today the Philippines sends close to 3,000 products to more than 200 countries. While the country’s exports, valued somewhere in the neighborhood of $62 billion, are now dominated by electronics, the European Union, Japan, the United States, and, increasingly, China and Singapore, continue to look to the Philippines for a wide range of natural resources and agricultural products. Fisheries products, although they are not the country’s top export, they remain central to the economic health of the Philippines. The nation, which has over 772,000 square miles (2.2 million km2) of highly productive seas, produced in excess of 3.1 million tons (2.7 tonnes) of fisheries-related products (including aquacultured products) in 2012. Fisheries employ an estimated 1 million people and fish is a significant source of protein, making the sector essential to the Philippines economy. Although most Philippine fisheries products are consumed locally, fisheries exports are valued at over $1 billion. Tuna, shrimps, and prawns lead Philippine fisheries exports, but aquarium fishes are an important subsector that, unlike many other fisheries, constitutes a high value–low biomass fishery. The aquarium fishery, more so than many other commercial fisheries in the Philippines, can bring sustainable economic growth to fishers and their communities while providing an economic incentive to fish sustainably. Although it did was not aimed at aquarium fisheries, the EU’s warning prompted the Philippines to act, and the reforms to fisheries law and the government’s approach to fisheries management are having a direct effect on aquarium fishery practices. These reforms have been covered extensively in the media insofar as seafood is concerned, but their effect on the aquarium fishery have gone largely unreported. Over the past year and a half, as Perez and the BFAR have worked on reform that targeted food fisheries, they have insured that new regulations and management procedures will apply to the aquarium fishery as well. In fact, Perez has personally engaged in the dialog about the aquarium fishery, leading to international collaboration that could have significant positive outcomes for the global marine aquarium trade. 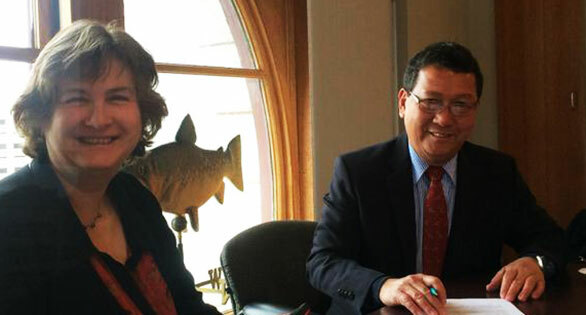 New England Aquarium CEO Nigella Hillgarth with Philippines’ Fisheries Undersecretary Asis Perez at the signing of the new agreement in Boston that some believe could prove a game-changer in the marine aquarium trade. Image: Ret Talbot. In addition to giving researchers at the New England Aquarium an opportunity to compare global export data from the Philippines to U.S. import data, the collaboration will build in-country capacity that can assist fisheries managers in better managing the country’s aquarium fishery. During the meeting at the Aquarium last March, Perez expressed enthusiasm for the project. He indicated that collecting the data was an essential part of the president’s fisheries reform mandate. 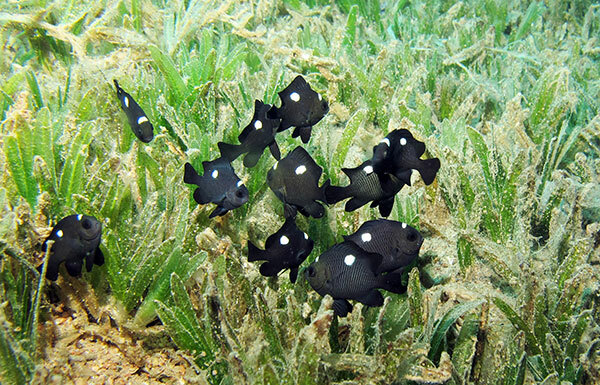 Domino Damselfish juveniles, a popular beginner’s fish in the aquarium trade. Image: Shutterstock. “The mandate of our president is very, very clear—to take out all unsustainable practices because in the long run it creates poverty,” Perez said. “Having not only the mandate but now the systems are all in place. We have the law, we have the people now, we have the vessels, we have the facilities, we are finalizing the system—so all of this is likely to be completed soon.” How soon? New England Aquarium staff will head to the Philippines in early November to meet with their counterparts from BFAR and begin work. NOAA funding is scheduled to run through July 2016, but the grant period may be extended if necessary. According to a 2014 Food and Agriculture Organization (FAO) report, “The prospects of better resource management in [the aquarium fishery] subsector are considerably brighter than they are for many other fisheries.” The signing of the Memorandum of Understanding between BFAR and the New England Aquarium certainly reinforces this optimism, and will bring solid data to bear on the discussion of the future of the aquarium trade. Red, Good article. I am happy to hear that BFAR is becoming proactive to regulate the aquarium trade and stop cyanide fishing. The damage to coral reefs due to cyanide and other factors like siltation and dynamite fishing is very extensive in the Philippines. I am also encouraged to learn that BFAR is helping support Net Training led by Steve Robinson. There also is good support from US-based importers. It is about time and action is needed. Otherwise, the petition to shut down the trade by the Center for BioDiversity may succeed. Red, Good article. I am happy to hear that BFAR is becoming proactive to regulate the aquarium trade and stop cyanide fishing. The damage to coral reefs due to cyanide and other factors like siltation and dynamite fishing is very extensive in the Philippines. I am also encouraged to learn that BFAR is helping support Net Training led by Steve Robinson. There also is good support from US-based importers. It is about time and action is needed. Otherwise, the petition to shut down the trade by the Center for BioDiversity may succeed. Peter Rubec, Ph.D.